In the 1830's Boers, farmers of Dutch origin, founded the republics of the Orange Free State and Transvaal. Later the British annexed the Transvaal, but at the battle of Majuba Hill in 1881 the Boers defeated them and won back most of their independence. The discovery of gold in the Transvaal brought not only wealth but an influx of uitlanders-foreignersmany ofthem British subjects, who by 1895 greatly outnumbered the Boers. The uitlanders were extortionately taxed, but President Kruger of the Transvaal, determined to maintain Boer supremacy, refused to give them the vote. After the failure of the raid on the Transvaal organized by Dr Jameson in the hope ofencouraging an uprising among the uitlanders, the Transvaal felt its independence threatened, and Kruger started importing arms. Sir Alfred Milner (governor in Cape Colony) exerted pressure on behalf of the uitlanders. Kruger demanded that Great Britain abandon its claim to suzerainty. Each side refused to yield. Kruger sent an ultimatum to the British which expired on 12th October 1899. Militarily the war fell into three phases of unequal length. In the first, which lasted from 12th October l899 until the end of that year, the initiative was with the Boers. They invaded Natal and the Cape Colony, stirred up rebellion, annexed British territory, besieged the towns of Mafeking, Kimberley, and Ladysmith, and in the second week of December - 'black Week' as it was known in Great Britain - defeated General Gatacre' at Stromberg, Lord Methtlen at Magersfontein, and general BuIler the commander'-in-chief, at Colenso. In this period the Boers were fighting strategically on the offensive, tactically on the defensive. They had the advantage of prepared positions - they were adept at fortifications, and the trenches dug by J.B. d~ la Rey at Magersfontein were sited with genius. Their rifles and their marksmanship were superior to those of the British; and they were certainly helped by unimaginative British generalship. ('Our gen erals,' remarked Asquith, the future prime minister, after reading one of Buller's dispatches, seem neither able to win victories nor to give convincing reasons for their defeats.') In the first fortnight of the war the British were outnumbered: 'they had barely 13,000 regular troops in South Africa and most of these were swiftly locked up in the three besieged towns. With the arrival of the 1st Army Corps at the end of October the balance changed; but Buller divided his forces and tried unsuccessfully to re lieve Kimberley and Ladysmith. By the middle of December Buller's command had been defeated at every turn and remained, barren of initiative, pinned down from the northern Cape to the midlands of Natal. Buller had lost his nerve. He was one of those unfortunate soldiers who are competent subordinates but fail in novel situations when in high command. After Colenso he signalled by heliograph to the besieged commander in Ladysmith that he should fire off his ammunition and surrender. It was this action which determined the British government to replace him as commander-in-chief; in his place came Lord Roberts, with Lord Kitchener of Khartoum as chief-of-staff. The 1st XI was being put in to the field. With the victories of 'Black Week' the Boers had reached what Clauswitz, the German military theorist, would have called the culminating point of victory after which they began to slip downwards. Roberts acted with imagination; Kitchener, displaying the restless energy that characterized his career, improvised a system of wagons for tr']ansport 'which unshackled the British troops from dependence upon the railway lines along which, hitherto, they had doggedly plugged into Boer fortifications. (The English', said General' Cronje, who was besiegirig Kimberley, do not make turning movements. They never leave the railway, because they cannot march.') His supplies secured, Roberts abandoned his lines of commuriication; outflanked: Kimberley, and sent General French on a remarkable cavalry ride which relieved the besieged town. General Cronje's besieging army was trapped in the gorge of the Modder river at Paardeberg, and shelled into surrender with 4,000 men on 28th February, the nineteenth anniversary of the Boer victory at Majuba Hill. Cronje's defeat sent vibrations of discouragement throughout the Boer armies. The forces around Ladysmith withdrew, and Buller was at last able to enter a town from which the attackers had gone. (Buller had already fought 'the bloodiest single engagement of the war, at Spion Kop.When the British and Boers both withdrew from the hill in the belief that they had been defeated. The Boers were the first to discover that the enemy had also gone.) Bloemfont~ in was occupied, and the Orange Free State annexed. General Pretorius, pinned against the mountains of the Basutoland Protectorate, surrendered with a large part of the army of the Free State. After pausing for seven weeks in Bloemfontein, largely because of a serious outbreak of enteric fever among his troops, Roberts resumed his march to the north, occupied Johannesburg and Pretoria, and shepherded the Transvaal forces eastwards down the railway line leading to the Portuguese colony of Mozambique. 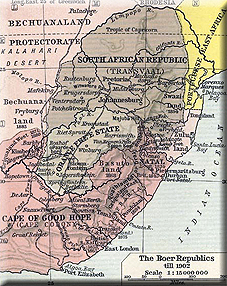 In September 1900 the Transvaal was annexed. The second phase - that of the great British counter-offensive - was over, and it seemed that with it the war was over. The third phase of the war lasted another eighteen months. This is sometimes referred to as the guerrilla war. The phrase is a misnomer. A guerrilla war is carried on by small bodies of irregular troops, acting independently. The Boer armies had been defeated in the field; 'they had been' dispersed' but they had not been broken. The Boer governments had been dislodged from their capitals; but, peripatetic though their existence was, they retained their authority. President Kruger, an old and broken man, had sailed from Lourenco Marques for Europe, but his authority devolved upon Schalk Burger, vice-President of the South African Republic, and was effectively shared with General Louis Botha; the Commandant-general of the Republic's forces. The seat of government of the Orange Free State was wherever President Steyn happened to be. In the eastern Transvaal General Botha, and in the western Transvaal General de la Rey, commanded large bodies of men; elsewhere the Boers reverted to their natural style of fighting, the swift movement of bodies of mounted infantry - the commandos - carrying their food with them or living off the countryside, harassing British communications. On paper, the two Republics had been annexed; but there was no effective occupation. The third phase of the war was'one of movement and attrition, in which a dwindling number of Boers maintained their resistance, hoping for a weakening of British resolution, and a large British army, constantly reinforced, lumbered about, over thousands of square miles of country, pecking away at Boer strength. It was in this third phase of the war that the contest changed its nature; it seemed to the Boers that the British were seeking to exterminate them as a people. It became increasingly difficult for the British to distinguish between civilian and military enemies. The new pattern showed itself first in the Orange Free State, renamed the Orange River Colony on its annexation. A large number of Free Staters had surrendered, and had been permitted to return to their farms after having taken an 'oath of neutrality' - a curiously named promise to take no further part in the war. Neither President Steyn nor, later, acting President Burger recognized either the annexations or the right of their own people to contract out of the war. The British provided little protection for those who had surrendered; Boer commandos pounced upon them and threatened them with immediate punishment as deserters, or more remote fears of punishment by the British as apostates. Roberts turned to 'farm-burning' of the homesteads of those who had broken their oaths, and a circle of reprisals began. Furthermore, 'camps of refuge', under military control, were set up in which the surrendered could take refuge with their families: this was the beginning of the system of 'concentrationcamps'. The last phase of the war was carried out against a background of military stalemate, divided counsels, administrative confusion and, on the British side at least, increasing friction between the military and the civilian authorities. In the Boer armies in the field, military and civilian authority were so entwined that it was practically impossible to separate them. On the British side, the military authorities were vested with power to do what the exigencies ofwar demanded; the soldiers did not see the war from the same point of view as the civilians. Both sides had, for different reasons, decided upon a fight to a finish. To Milner, the object of the war was to break Afrikaner nationalism: the terms offered to the Boers in 1900 were (in a phrase borrowed from the US Civil War general, Grant) 'unconditional surrender'. In 1901, after Lord Kitchener had unsuccessfully offered terms of peace to General Botha at Middelburg, the two Boer governments met at Waterval and agreed that neither should conclude a separate peace unless the annexations were reversed and the independence of the Republics restored. Given these conditions, the war would continue until the last Boer had been killed or captured. Roberts had given up the command at the end of 1900, to be succeeded by Kitchener. Kitchener had his own reasons for ending the war'as soon as he could; he wished to be given the post of commander-in-chief in India, which he feared would elude him if he could not end the campaign in South Africa quickly; he was not concerned with the political consequences of his actions; rapidly his regard for Milner deteriorated into indifference, Milner's for him into mistrust. In military operations it seemed that the British army had lost the initiative, and was compelled, in innumerable local actions, to react to Boer movements. General Christian de Wet made two spectacular raids, in which he slipped through superior British forces and made his escape. Militarily, de Wet's operations achieved little that was lasting, but they did demonstrate the inability of the British army either to catch or to force a commando to battle against its will. At the end of 1900 the Free State generals, Kritzinger and Hertzog, invaded the Cape Colony for the second time, and touched off a second, and far more serious rebellion. In 1901 the former Transvaal state attorney, Jan Christian Smuts, who had taken to arms with considerable native ability, conducted a spectacular raid into the Cape Colony, which took him within sight of Cape Town and on into, the far north-west of the Colony. By the end of 1901 almost the whole of the Cape Colony was under martial law. The British army in South Africa had a strength of close on a quarter of a million; the Boers at no time had more than 30,000 men under arms; but the British were scattered over lines o fcommunication of several thousand miles. In this predicament Kitchener turned to a policy of what would later have been called 'scorched earth'. He began the system of the 'great drives' - a methodical extension of the 'farm-burning' begun by Lord Roberts. Columns of troops swept the countryside, driving off herds of cattle and sheep, burning farm houses and burning crops. Later, this was supplemented by the blockhouse system; barbed wire entanglements, interspersed at short distances by small pill-box fortifications, criss-crossed the country for thousands of miles. The aim was to make it difficult for the Boers to move - if not themselves at least their supplies - and thus to compress the theatre of war. In the end, given great resources and unlimited resolution, it was bound to succeed; but at a ruinous cost to the countryside of what were now British colonies, and at the price of turning into irreconcilables those whom it was intended to transform into British citizens. Boers taken from the shattered farms - mostly women and children - were herded into hastily contrived concentration camps; these were now less places of refuge than places of confinement. In 1901 these camps were swept by disease - pneumonia, measles, and enteric fever - which killed the inmates by the thousand. This was not as the Boers believed, the product of malice: it was the result of inefficiency in administration and lack of sanitary knowledge. But the result was the same: about 20,000 Boers died. The facts were publicized in Great Britain through the work of Emily Hobhouse, who visited the camps in 1901. Sir Henry Campbell-Bannerman, the leader of the opposition, described the activities of the British army as (methods of barbarism' (a judgement which Lord Milner had privately uttered much earlier to Joseph Chamberlain, the colonial secretary); and the news increased the odium under which Great Britain already lay in world opinion. Death from disease in the camps, the destruction of their homes and means of livelihood, the annexation of their countries: these were the grounds of permanent resentment which the war had already given the Boers. To these was added another: death by execution. In 1901 Kitchener began executions in the field. The death penalty was exacted sometimes for rebellion, sometimes for the killing of non-Europeans. Both sides had conformed to the convention that this was to be a white man's war; it had been explicitly stated by the secretary of state for war that the non-white peoples should be armed only for their own protection. Kitchener enlisted about 10,000 non-whites, and used them as wagon-drivers, messengers, and blockhouse guards. The Boers shot non-whites captured with arms; British courts-martial condemned Boers to death for murder. Boer commandos in the Cape Colony burned down public buildings, partly as acts of war, partly in reprisal for what had been done in the Republics. Arson was added to the offences for which Boers might face the death penalty. Two commando leaders Lotter and Gideon Scheepers - were executed in the Cape Colony. In all this Milner found himself powerless. He had moved from the Cape to the Transvaal in 1901, and was doing a great deal to place the industrial area of the Witwatersrand under settled government. The mines were slowly re-opened; the work of reconstruction began. Had he been given his way, Milner would have placed other areas of the country under effective occupation, settled upon it those many Boers in the prison camps who had sickened of the war, and have contained the remaining commandos by essentially police operations. Afrikanerdom, he felt, could thus be divided against itself; the odium of continuing the war would fall upon the Boers who continued a hopeless struggle. He was able to produce astonishing feats of hygiene when the concentration camps, after the damage had been done, were passed over from military to civilian control. But Milner was adamant that there should be no negotiated peace with the Boers; the Republics were to be effaced. Kitchener was quite prepared to end the war by negotiation, if he could, by ruthlessness if he could not. Unhappily, the only victims of ruthlessness were the Boers in his hands: the commandos in the field remained out of reach. Both sides were wavering. The British government had tired of a war that was expensive, humiliating, and, from the electoral standpoint, politically corrosive to the Unionist government. The Boers were likewise divided. The Free Staters remained adamant that no peace should be made without independence. The Transvaalers were less resolute, or more realistic. The Free State had been ravaged from end to end; but the Free State would remain predominantly Dutch. The centre of the Transvaal was being transformed into a British colony. Let them negotiate while their army was still in being, when their military power might yet enable them to win some concessions: the alternative would be the extinction of their language, the banishment of their leaders - the end of Afrikanerdom. Thus, when, under Dutch prompting, the British government sent an offer to the Boers to parley, it was the Transvaalers who were prepared to bargain, the Free Staters who insisted upon no surrender, a fight 'to the bitter end'. In the long drawn-out peace negotiations - between the Boers themselves at Klerksdorp, between the representatives of the Boers and Milner and Kitchener in Pretoria, between the representatives of the Boers at an assembly of the people at Vereeniging, between the Boers and British again, and finally the last session of the Assembly of the People at Vereeniging, and the final signing at Pretoria - there appeared a curious cross-alignment: President Steyn and the Free Staters in strange harmony with Milner, for unconditional surrender and the continuance of the war; the Transvaalers and Lord Kitchener for a negotiated peace. The 1902 (Treaty of Vereeniging' (as it came to be called), was very far from unconditional surrender. It was a negotiated settlement, in which the Boers were promised eventual self-government, 'natives' were excluded from political rights, the Dutch language was safeguarded, and in which the Boers acknowledged themselves, under protest and with reluctance, to be British subjects. It seemed at the time to be a civilized and liberal settlement of a bitter struggle. The Boers could hold that they had remained unbeaten in the field; the spirit of Afrikaner nationalism was unbroken. The British had a nasty shock, but the reforms in the army and in diplomacy as a result of this war would actually prepare them well for the forth coming World War.